One Live Plant Shipped In a 3.5 Inch Square Pot. Botanical Name: Mentha piperata. Hardy perennial. 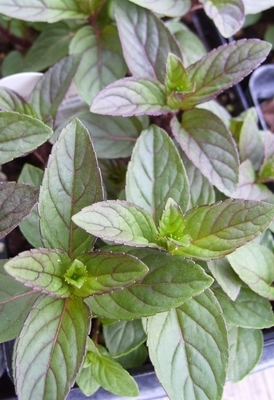 Peppermint's versatility and ease in growing make it the perfect beginner's herb. Smooth edged, shiny, dark green leaves are indispensable for teas, candies, and flavored sugar. Known as Black Stem Peppermint. Very strong peppermint scent.